After finding out that several common commands (such as read) are actually Bash builtins (and when running them at the prompt I'm actually running a two-line shell script which just forwards to the builtin), I was looking to see if the same is true for true and false. Well, they are definitely binaries. However, what I found most surprising was their size. I expected them to be only a few bytes each, as true is basically just exit 0 and false is exit 1. However I found to my surprise that both files are over 28KB in size. So my question is: Why are they so big? What's in the executable other than the return code? In the past, /bin/true and /bin/false in the shell were actually scripts. Nowadays, at least in bash, the trueand false commands are implemented as shell built-in commands. Thus no executable binary files are invoked by default, both when using the false and true directives in the bash command line and inside shell scripts. So it can be said with a high degree of certainty the trueand false executable files exist mainly for being called from other programs. From now on, the answer will focus on the /bin/true binary from the coreutilspackage in Debian 9 / 64 bits. (/usr/bin/true running RedHat. RedHat and Debian use both the coreutils package, analysed the compiled version of the latter having it more at hand). As it can be seen in the source file false.c, /bin/false is compiled with (almost) the same source code as /bin/true, just returning EXIT_FAILURE (1) instead, so this answer can be applied for both binaries. Alas, the direct question to the answer why are true and false so large? could be, because there are not anymore so pressing reasons to care about their top performance. They are not essential to bash performance, not being used anymore by bash (scripting). Similar comments apply to their size, 26KB for the kind of hardware we have nowadays is insignificant. Space is not at premium for the typical server/desktop anymore, and they do not even bother anymore to use the same binary for false and true, as it is just deployed twice in distributions using coreutils. Focusing, however, in the real spirit of the question, why something that should be so simple and small, gets so large? 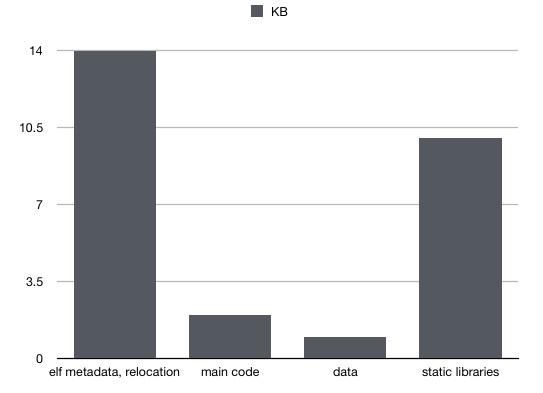 The real distribution of the sections of /bin/true is as these charts shows; the main code+data amounts to roughly 3KB out of a 26KB binary, which amounts to 12% of the size of /bin/true. The true utility got indeed more cruft code over the years, most notably the standard support for --version and --help. However, that it is not the (only) main justification for it being so big, but rather, while being dynamically linked (using shared libs), also having part of a generic library commonly used by coreutils binaries linked as a static library. The metada for building an elf executable file also amounts for a significant part of the binary, being it a relatively small file by today´s standards. The rest of the answer is for explaining how we got to build the following charts detailing the composition of the /bin/true executable binary file and how we arrived to that conclusion. Of the 24KB, around 1KB is for fixing up the 58 external functions. That still leaves around roughly 23KB for rest of the code. We will show down bellow that the actual main file - main()+usage() code is around 1KB compiled, and explain what the other 22KB are used for. Drilling further down the binary with readelf -S true, we can see that while the binary is 26159 bytes, the actual compiled code is 13017 bytes, and the rest is assorted data/initialisation code. So my first suspicion was partly correct, whilst the library is using dynamic libraries, the /bin/true binary is big *because it has some static libraries included with it* (but that is not the only cause). Compiling C code is not usually that inefficient for having such space unaccounted for, hence my initial suspicion something was amiss. The extra space, almost 90% of the size of the binary, is indeed extra libraries/elf metadata. While using Hopper for disassembling/decompiling the binary to understand where functions are, it can be seen the compiled binary code of true.c/usage() function is actually 833 bytes, and of the true.c/main() function is 225 bytes, which is roughly slightly less than 1KB. The logic for version functions, which is buried in the static libraries, is around 1KB. The actual compiled main()+usage()+version()+strings+vars are only using up around 3KB to 3.5KB. It is indeed ironic, such small and humble utilities have became bigger in size for the reasons explained above. The implementation probably comes from GNU coreutils. These binaries are compiled from C; no particular effort has been made to make them smaller than they are by default. Of course, your binaries are even bigger. That's because they also support command line arguments. Try running /usr/bin/true --help or /usr/bin/true --version. In addition to the string data, the binary includes logic to parse command line flags, etc. That adds up to about 20 KB of code, apparently. Stripping them down to core functionality and writing in assembler yields far smaller binaries. Original true/false binaries are written in C, which by its nature pulls in various library + symbol references. If you run readelf -a /bin/true this is quite noticeable. 352 bytes for a stripped ELF static executable (with room to save a couple bytes by optimizing the asm for code-size). $ ./true ; echo $? $ ./false ; echo $? Or, with a bit of a nasty/ingenious approach (kudos to stalkr), create your own ELF headers, getting it down to 132 127 bytes. We're entering Code Golf territory here. ; or  mov dil,1  for false: high bytes are ignored. $ chmod +x true2 ; ./true2 ; echo $? Pretty big on my Ubuntu 16.04 too. exactly the same size? What makes them so big? So there is help, there is version information, binding to a library for internationalization. This explains much of the size, and the shell uses its optimized command anyway and most of the time. Not the answer you're looking for? Browse other questions tagged linux reverse-engineering or ask your own question. Why is /bin/true 27168 bytes in size? Tools for showing which files are accessed by a program? Why is bash 'not always' showing the 'Terminated' message after killing a process? Why are .so files executable? What is the value of boolean(True and False) in Python concept and shell concept?